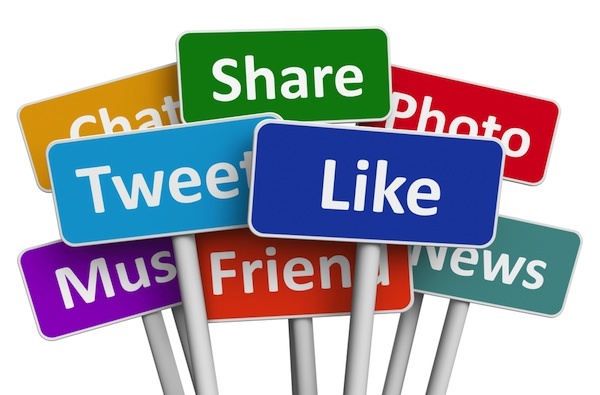 Social media can be somewhat of a poison chalice for certain brands, 2014 was no exception. Here are the top of Twitter fails of 2014, where brands and organisations got it all wrong. Really wrong. 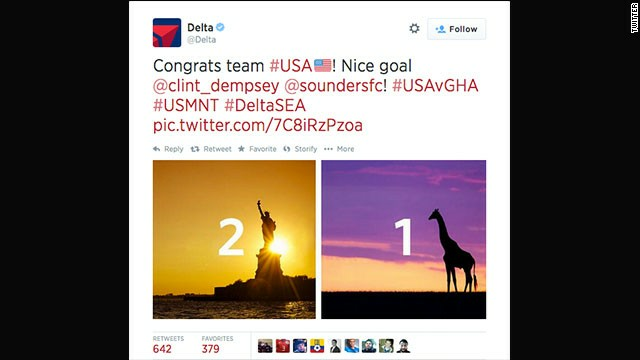 In the height of the world cup fever, Delta airlines posted a tweet to congratulate the USA on its win over Ghana in June. The photo they tweeted featured the statue of liberty going head-to-head with a giraffe. They only problem is that there are no giraffes in Ghana. The British Embassy tweeted a photo joking about the day the Redcoats burned down the White House during the war of 1812. The tweet in August showed a cake topped with a mini White House and sparklers. “Commemorating the 200th anniversary of burning the White House. Only sparklers this time,” the tweet read. The British Embassy quickly apologised to their American friends. A tough year for airlines on social media this year, US Airways attached an X-rated image of a naked woman with a toy airplane between her legs to an otherwise innocuous tweet about customer reviews. A spokesperson called the tweet, “an honest mistake” and said the poster would not be fired for it. American Apparel decided to celebrate the 4th of July by posting an “artistic” image to their Tumblr and tagged it with #smoke and #clouds to mark the occasion. Turns out the “firework” was actually a photo of the Challenger space shuttle exploding. 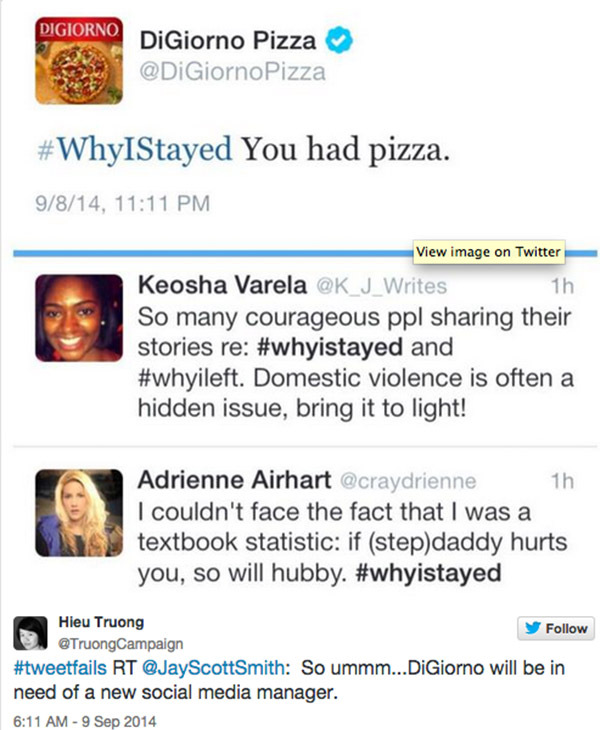 Without doubt, one of the biggest and most notable fails of 2014 was DiGiorno using the hashtag #WhyIStayed. When critics questioned Janay Rice’s decision to marry ex-NFL Baltimore Ravens star Ray Rice despite the history of abuse, domestic violence victims rallied on Twitter. Using the hashtag, #WhyIStayed, they explained why they stayed in abusive relationships. However, DiGiorno didn’t quite get it and instead tweeted this. The company quickly apologised and claimed that it “did not read what the hashtag was about before posting.” Remember people, research your hashtags before jumping into the conversation.